For those familiar with Heart of the OHR, feel free to skip down to the rules for a reminder of what was, and a taste of what will be. For those who are uninitiated, please read the following history lesson. Or don't. Your choice. It seems that as times change, interests start moving in new directions, and the things that first captured our hearts and attention about indie-RPG design had since faded into obscurity. Toward the end of the '90s and the early part of this decade [2000s], RPGs were king, and were, incidentally, the only thing the OHR was capable of making. And then, as the decade continued, RPGs became less common, less desired, and soon the rate of releases made on the engine went from a sprint to a crawl. Then, in about 2006 or 2007, the limits of the OHR began to change, and new life formed. Side-scrollers were now not only possible, but easier to make. Puzzle games, menu-based games, and even street fighting games were beginning to surface in droves throughout the course of three years. 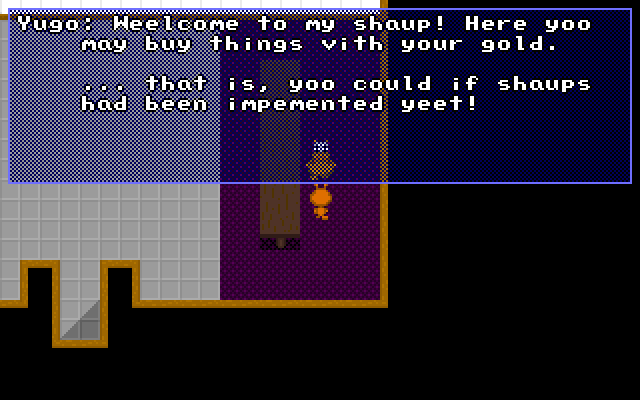 And during this time, the course of the OHR RPG began to fall. RPGs were released on occasion, but the presence of one became rare, and almost surprising. And even then, the likelihood of it being a joke game was high. No, the integrity of the epic vacation gave way to a cheap day-trip, and by 2009, the nature of the RPG had become nearly absent. [In June 2010], Surlaw and I were discussing the disappointment of creating huge games, which translates to many, many hours of development time (read: three years or more for some games), that people refuse to play because it requires them to fight random battles (that aren't titillating 100% of the time), or read text (of any length), or spend more than a few hours of game time in order to finish it. Authors who put the level of time and attention that goes into a quality game, just to have it go unplayed because of an unwillingness to read (for example), are highly disheartened, and certain OHR gems have gone unfinished because the author experiences What's-the-Point? Syndrome. This, of course, has contributed to the huge decline of RPGs--and especially in the quality RPGs--in our opinion, and that should be shocking when one considers we're a community focused on an RPG making engine. Even James Paige once expressed a slight disappointment in the gradual reduction of games that actually use the default features to, you know, make an RPG. That is what the OHRRPGCE was made for. It's hard to say whether the modern RPG is dying or just in a slump, but we'd like to see this giant of yesteryear make at least one more stand in the community. So, I am proposing the "Heart of the OHR Contest," which is a contest, quite simply, about making the best RPGs we can make with the engine that brought us here in the first place. -NonRPGs not permitted (See Above). -Joke games not permitted (though funny ones are okay). -Special scripting is okay (as long as it doesn't turn the RPG into a nonRPG). -Games must have at least 30 minutes of playtime with a good chunk of that devoted to story (in other words, 30 minutes without level grinding). -Updates to previous RPGs permitted and even encouraged. -Updates to previous RPGs need at least 30 minutes of new content to be eligible. Changing a textbox to an old two-hour game and re-releasing it doesn't make it eligible. Same goes for graphics overhauls. New playable content, people! -If you are posting a rereleased game for the contest, you must provide either a readme (or some document) discussing where the new content starts (if it's a continuation) or what the new content is (if it's integrated into earlier previously released sections), or you must supply a save file that begins the game just before the new content kicks in. If you fail to do this, your game will not be entered into the contest. Note: I prefer the former since it's clearer what's new and discourages players from beginning your game halfway into the story. Important Note: Historically, players are really bad about investigating new content and often replay the old stuff and vote on that without ever seeing the new content. This really skews the results at the end of the contest. This is especially true of long games. If you are submitting a rerelease and you care about doing well, please, please, please be abundantly clear about what's new and give your players every possible incentive to play to the new stuff. This means improving the first 30 minutes of the game if necessary. This means making the whole game as fun and amazing as possible. Don't turn your players off early or they may never get to the new content. Remember, just because you provide a save point or obvious information about where the new stuff begins and ends doesn't mean your players will use it. If they end up just voting on the same stuff they played five years ago, your points may not count. Think about the whole game. -Fan games and parodies discouraged, but not forbidden. Original stories preferred. -As the only exception to the must-be-an-RPG rule, you may alternatively release a game that's "in the spirit of 1999" and still be eligible for entry. This means that you may emulate the kind of game that was made for the OHR between 1998 and 2000. This rule was made possible by T4R4D1DDL3, so consult that game to see this rule in action. New Rule for 2018: I'm accepting almost any RPG type you can think of this year. This includes rogue-likes, walking simulators (with stat progression and level-ups), Zelda II clones, 3D mazes, etc. If the OHR can make it, and it still has classic level and stat progression, and there's still a story attached, it should qualify. Use your slice collections and stat displays! Use your fancy animations! Use your procedurally generated maps with seeds! Just make it great! And make the most of it because I'm taking the Heart of the OHR back to the beginning in 2020 where most of these fancy exceptions will go away. New Rule for 2018: With platforms like Steam making it possible for indie game designers to put their games up for sale, we are beginning to see an uptick in OHR users designing their games for commercial use, including those that involve licensed characters like Kaiju Big Battel and Axe Cop. Any game released for commercial purposes can still participate in the Heart of the OHR, but either a key, or a demo, or some alternative agreement should be provided to players if it's to enter the voting stage. Keep it accessible! In 2010, every entry was lumped into the same category and judged under the same conditions regardless of originality versus the rereleased. In 2012, they were divided into three categories: Original, Rereleased, and OHR Legends. In 2014, they were separate categories, but shared the same vote. We continued this trend in 2016. We will be continuing this trend in 2018. Original games are the games that have never been publicly released prior to May 1, 2018. These are the easiest to judge since the ground is fresh. We had eight original entries in 2010, including the Game of the Year winner, Motrya, 13 in 2012, nine in 2014, and 11 in 2016. Note: These games just need to come with a Coke and a smile. Rereleased games have been unleashed on the community before May 1, 2018, and are making a second-life appearance in the Heart of the OHR Contest. Any original game that was released for the 2010, 2012, 2014, or 2016 contests will automatically default to this category if reentered for 2018. In 2010, we had four rereleased games. In 2012, we had three. In 2014, we had one. All games were original in 2016. Note: These games must include documents or save files that inform the player where the new content can be found. See the rules above for more information. This special category is reserved for the games that have been submitted as rereleases in previous Heart of the OHR contests and resubmitted this year as "legendary" contestants. There are nine games eligible for Level 1 Legend status and two (Vikings of Midgard and Okedoke) eligible for Level 2 Legend status. In addition to a potential win, these games also get a "level badge." Unlike traditional contests, "Heart of the OHR" will not require a start time or an end time per se. Rather, this will adopt the "release window" technique made popular with Game-a-thon, in that any RPG released within the window is eligible (provided it meets the above standards). Window begins May 1st and ends December 15th, with a one-day grace period for special cases and accounts for time zone differences. Traditionally, I end the contest in November and allow a two-week grace period for bug-fixing (Note: this grace period is not reserved for adding new content, unless that new content is required to fix a bug or to tie a loose thread). This year, I'm including the bugfix period as part of the deadline, so try to have your games done by November 30th and bugfixed by December 15th. Entries must be ready for voting by 6am EST, December 17th. Voting will run from December 17, 2018 - January 27, 2019. That gives you a whole six weeks to play these games! Make it count. Note that I will not close voting until I have a minimum of 10 votes, so if the deadline comes and goes and I have fewer than ten, voting will remain open until the minimum is met. I want all contestants to have a fair playthrough and comment/critique/score for their games. The way we handle votes will be the same as in the 2014 and 2016 contests. Five-point Average: Any game that falls short of the peak vote target range will receive however many fives it takes to reach the two-thirds margin. Peak Vote Target Range: Identifies the game with the most number of votes and uses its vote count as the determinate for the contest average. Two-thirds Vote System: Caps the required voting minimum at two-thirds the value of the peak target. Any game meeting this minimum cap will not receive additional fives to pad its average. Note: New Prizes for 2018. Anyone out there can add to the prize pot if he or she has something to offer, so feel free to help make this into a treasure trove of winnings if you want to, and if you have the resources for it. I'll update the prize list here as new prizes are offered. New prizes can be added until the end of the contest. -Short saga of character by winner's design, to be included in the religious lore of the game Starfire. Note: This list will remain open to new prize additions from now until December 17th. I will update this list as I get new volunteers. Any game categorized as an OHR Legends release will receive a special trophy classifying it as such. This is strictly a prestige award, but it will remind future players of the game's longevity. This trophy will receive "levels" each time it's awarded to a specific game. OHR Legends releases should still meet the 30 minutes of additional game time rule to be eligible for the trophy. So, as you can see, it would be crazy not to join and make something for the Heart of the OHR Contest, so take the chance. *Because prizes are awarded by members of the community, and because community members come and go like the wind, all prizes are subject to change. **I reserve the right not to record a game or post it to YouTube if I think the content is unsuitable for my channel. This will include games with excessive cursing, any sexual content above a PG-13 level, excessive gore, offensive themes (or anything I think will anger people, which could be anything these days, so I'll use discretion), demonic themes (this is a personal choice, as I do not want this theme on my channel), or games with unlicensed content (commercial music, characters, etc. used without permission). ***Value will be determined by the prize holder, Wobbler. Contact him for details. *****Value of Amazon card determined by the prize holder, Foxley. Contact him for details. Release the best game you're capable of making. The community doesn't want to see or play throwaway titles anymore. Do your best to make a quality game. While you shouldn't be intimidated by this, you still need to be aware that games like Wandering Hamster and Motrya are just as capable of making an appearance during the contest window as any game, so make it your best if you want the winning prizes. Have fun. Please use this thread to announce your RPG releases starting on May 1st. And I'd appreciate it if this thread were stickied until the end of the year. Thanks. I will update this thread periodically as new information comes. Good luck, everyone. * Many new map-editor features, including mouse support. * Customizable hero experience curve. * Textbox save/load/delete/end game conditionals. * Unhid still-experimental option for non-320x200 games. * Copy-paste text between the editor and other applications. * Visual browsers for sprites and many other things. So, OHRRPGCE is the reason I work in the game development industry today. I discovered it when I was only 10 years old (18 years ago!) and I've been making games ever since. Some of you may know the development and publishing studio, MADSOFT Games, that I founded in 2008 (I used "MADSOFT" as my username on here way before I founded that though!). But I've also worked at various other studios including EA Games, Ubisoft, and Juicy Beast thanks to that experience. I switched to working at MADSOFT Games full-time back in 2012 and grew the studio exponentially after moving it to Edmonton, Alberta. We built up the game development industry there, founded several events, fostered growth in the indie community with our advocacy group and gam jams, worked with schools and existing local studios to make sure developers stayed in the city after graduating, and a lot of new indie studios came to be thanks to us. So you are not only responsible for my own career, but also indirectly responsible for all the good we've done for the industry and community in Edmonton. I've also done a ton of talks and been on a lot of panels at conventions. And whenever I'm asked how I got into game development at those panels, I always mention OHRRPGCE. I wouldn't be where I am today if it weren't for this engine and the Castle Paradox community. RedMaverickZero, Fenrir-Lunaris, JSH357, Fyrewulff, Moogle1, etc. You all inspired me. Thank you! A little over a year ago, I got married and my son was born a month after that. I decided to move out of Edmonton and, earlier this year, I stepped down from my position as director at MADSOFT Games for various reasons. One of those reasons included wanting to get back to working as an indie developer. MADSOFT is pretty corporate now, what with investors, employees, etc. Too much relies on the company and we couldn't take as many risks anymore, and I missed having the creative freedom that came along with being a small two-person indie studio. So, on November 1st, I launched a new indie studio, Wild Gamut, along with co-founder Marjorie Paré. I thought that it would be appropriate for me to come here and share the story and the studio, seeing as this is where it all began. We're investing our own money into the studio as capital, but we also started a Patreon to help us reach our goals quicker and alleviate a bit of the stress that comes along with bootstrapping. I really hope to have your support with this new venture and I look forward to sharing our new games with you, even though they aren't built in the OHRRPGCE. Yes, really! 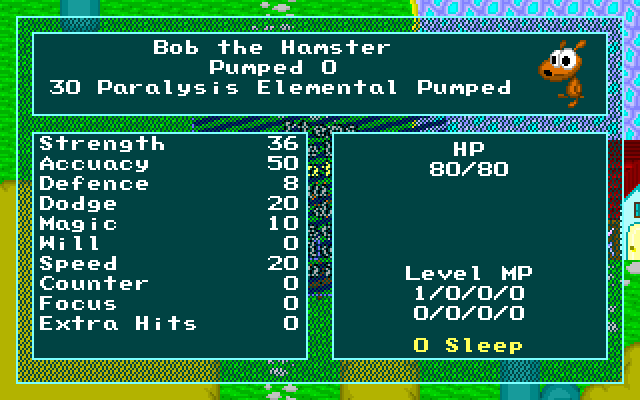 Today, is the remarkable 20th anniversary of the oldest surviving copy of the Official Hamster Republic Role Playing Game Construction Engine, a demo of Wandering Hamster dated November 4th, 1997. See Timeline on the wiki for lots of tidbits about the start of the engine. To play it, you will just need to rename the WORKING folder in the .zip to something ending in .rpgdir, like WANDER.rpgdir, so that the engine will recognise it as a game. This demo of WH has no music or title screen. 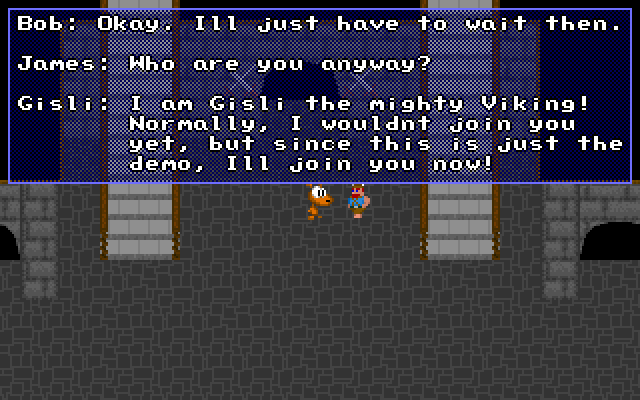 Flanat only has four buildings, and the demo is pretty short, with not too much to do at Hasim Castle but fight Broaste, although I did stumble upon a secret area which has since been removed! It is a long walk back and forth to the castle, and you do need to level a bit to beat Broaste. Uhh, well the one thing that doesn't work is that lots of global text strings are mixed up! Theres lots of status effect messages which got removed later. A new stable ohrrpgce release is upon us!